Originally hailing from Wheeling, West Virginia, I am a coal miner’s daughter and a child of the millennium. After graduating from Case Western Reserve University in 2006, I spent several years searching before finding personal zen creating art in my home town. Throughout my life I’ve been enthralled with the simple elegance found in many Eastern art forms, from which I draw many of my techniques and inspiration. Born under the sign of Virgo in the year of the Rat, my meticulous nature is reflected in the art I create. Although I dabble with various mediums, my preferred techniques include origami & paper crafting, knotting & braiding, and graphic design. Every artist has their muse. Luckily, I have two! 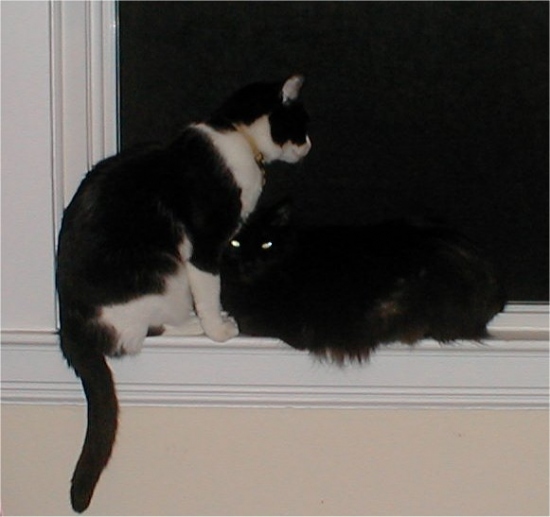 I am the caretaker and friend of two dichromatic male cats: Sparkplug (age 9), and Fidget (age 2). Below is my Bachelor (on the right) and Sparkplug, pondering the evening of Cleveland. And this is my youngest (but biggest!) Fidget. I love the way kitties’ eyes glow under flash. i’m bookmarking this blog & visiting another timefor updates. Thank you. I really like this Page design! Simple yet effective. I’m gonna share your site with my coworker. He’s looking to redo his site and I’m trying to gather a few examples for him. I hope you don’t mind. Thx! Hello! Someone in my Facebook group shared this website with us so I came to take a look. I’m definitely enjoying the information. I’m book-marking and will be tweeting this to my followers! Superb blog and brilliant design.